Sarah Thomas referees an NFL game at the Mercedes-Benz Superdome on August 30, 2015 in New Orleans, Louisiana. 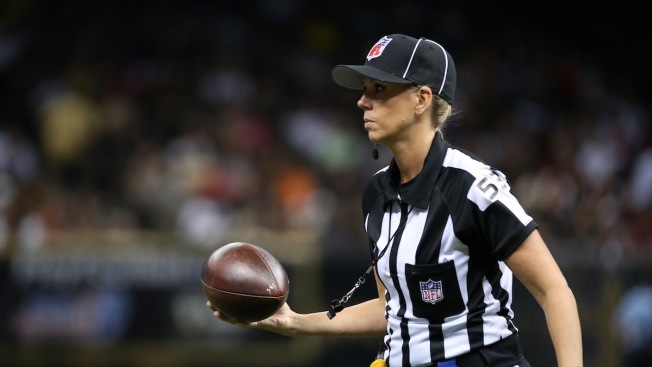 Sarah Thomas, an American football official, has seen a litany of football firsts. She was the first woman to referee a major college football game, the first to officiate in a Big Ten stadium and the first to officiate a bowl game. On Sunday, she’ll become the first woman to officiate an NFL playoff game as the Patriots and Chargers face off in the AFC divisional playoff. Women comprise roughly half the NFL’s fan base, making up about a third of fantasy sports players and are integral to league growth. Female viewership increased by 26 percent from 2009 to 2013, while male viewership increased by 18 percent, according to data from Ebiquity. Still, there has never been a woman head coach or general manager of any team, and women make up just a third of league employees. The NFL has made a number of recent attempts to include more women. It launched its first women’s summit in 2016, an event that has since brought together iconic female speakers from sports organizations around the world. It also started the Women’s Careers in Football Forum, which educates and prepares women for positions in football operations. But the league still struggles with representation. The Institute for Diversity and Ethics in Sport’s NFL Racial and Gender Report Card gave the NFL a “C” in gender hiring practices for 2017. Female representation among team vice president positions decreased to 23.5 percent and team professional staff positions to 37.2 percent, the report showed. Women held only 20 percent of the senior administrator positions during the 2017 NFL season (a 1 percent dip from 2016). There were, however, notable improvements in other areas: Representation increased in management positions to 31.6 percent and staff positions in the NFL office to 39.6 percent. Other notable hires in the past couple years include Katie Sowers, who in 2017 became the NFL’s first openly gay and second full-time female coach, and Kathryn Smith, who during the 2016-2017 season became the first woman to hold a full-time coaching position.